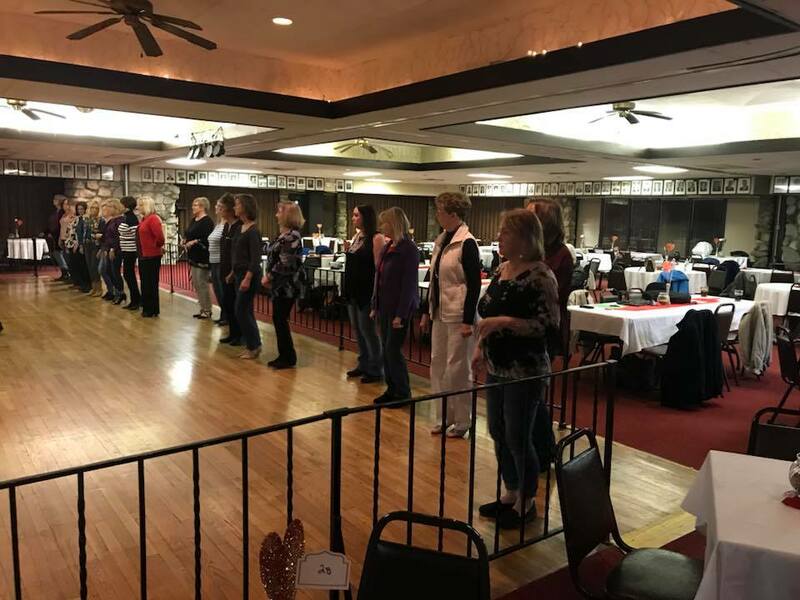 New dance lesson schedule added. Click on the Dancing tab. We have a dance & dance lesson every Wednesday night @ 6:55pm at the Eagles 6000 Old Booneville Hwy Evansville, Indiana. Come join us!!! 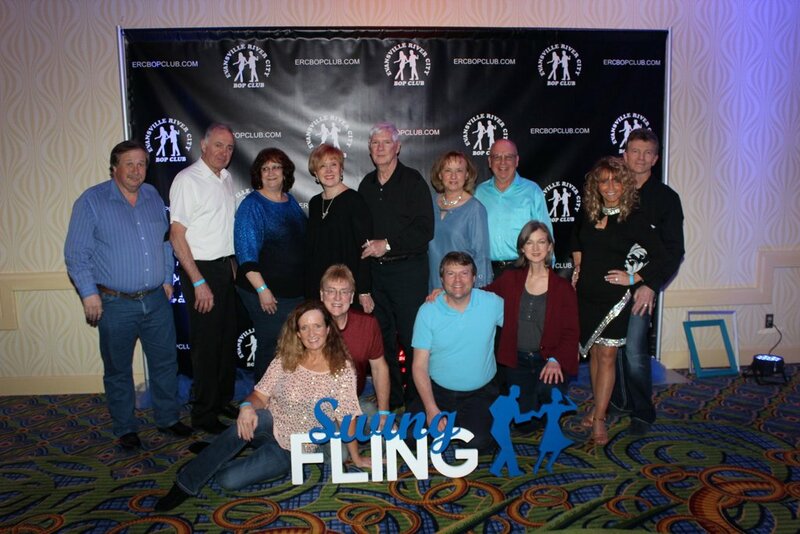 Get your tickets for Swing Fling 2019 March 28, 29 & 30 using the ticket button below. 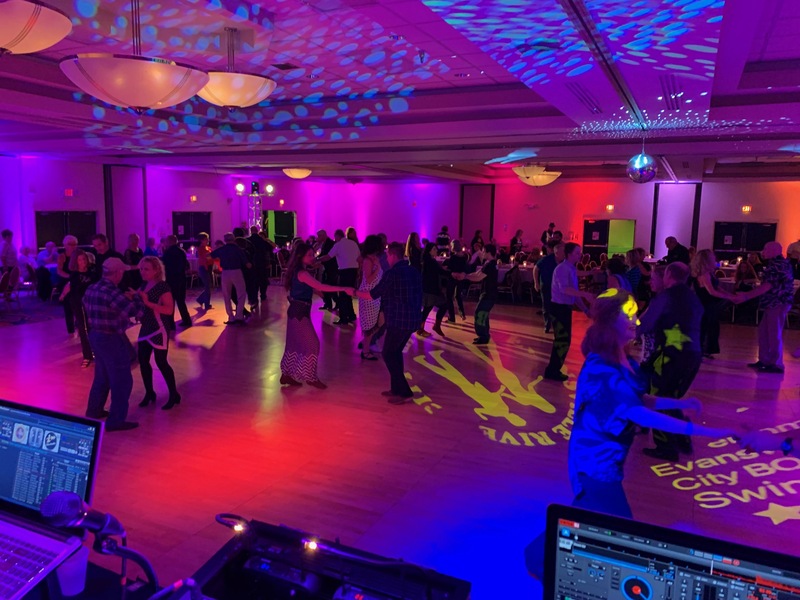 We are a non-profit dance organization directed toward the entertainment and fellowship of the members and devoted to the preservation of a great American dance style collectively known as "swing" but actually encompassing dozens of different dance styles and hundreds of variations. Our music is bop, shag, and rhythm and blues which will inspire you to dance to the rhythm of the beat. 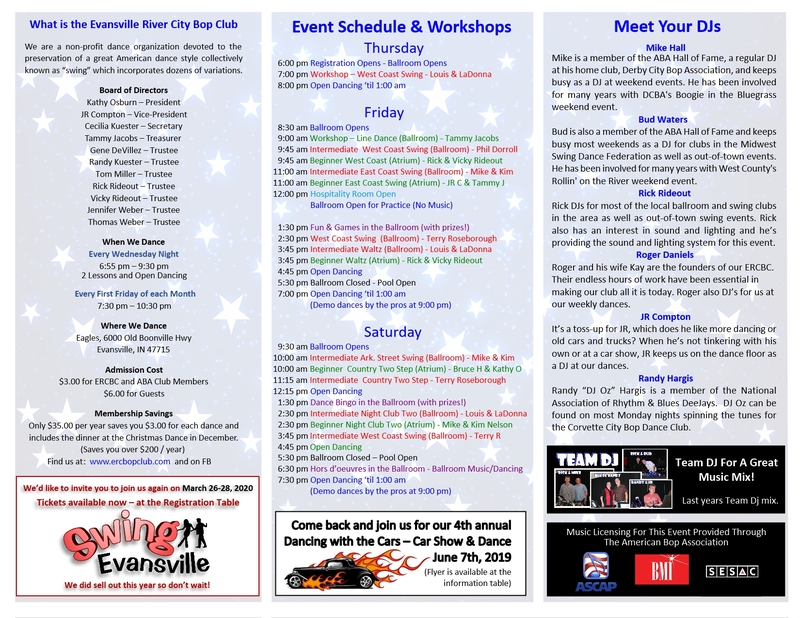 So come along and let us introduce you to the people, the dance, and the music collectively known as the Evansville River City Bop Club. 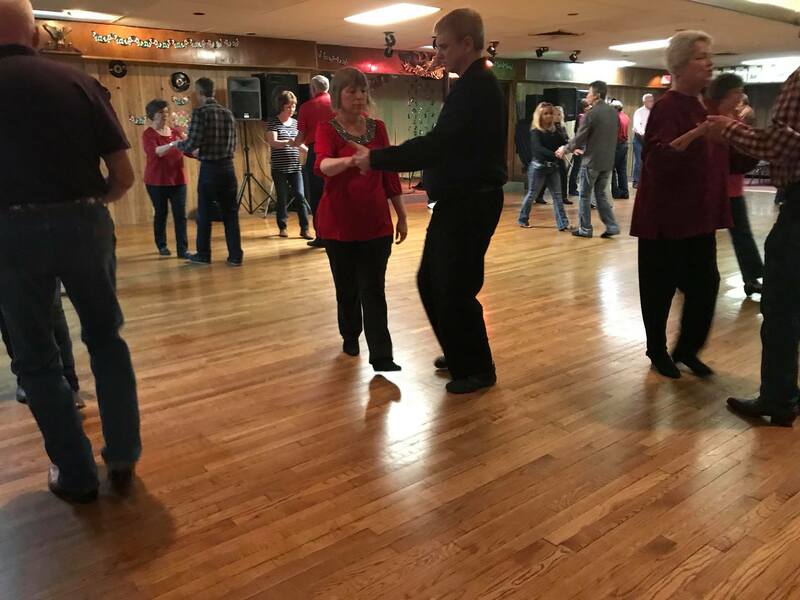 We enjoy visitors anytime…we encourage you to come dance with us. 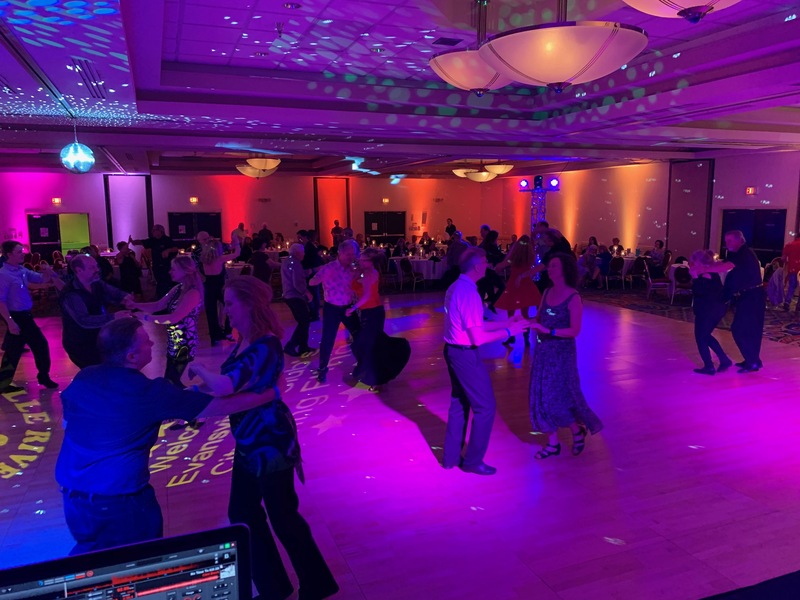 Swing Fling 2019 Tickets on Sale. Swing Fling 2018 is now history. Huge dance floor with amazing sound and lights. 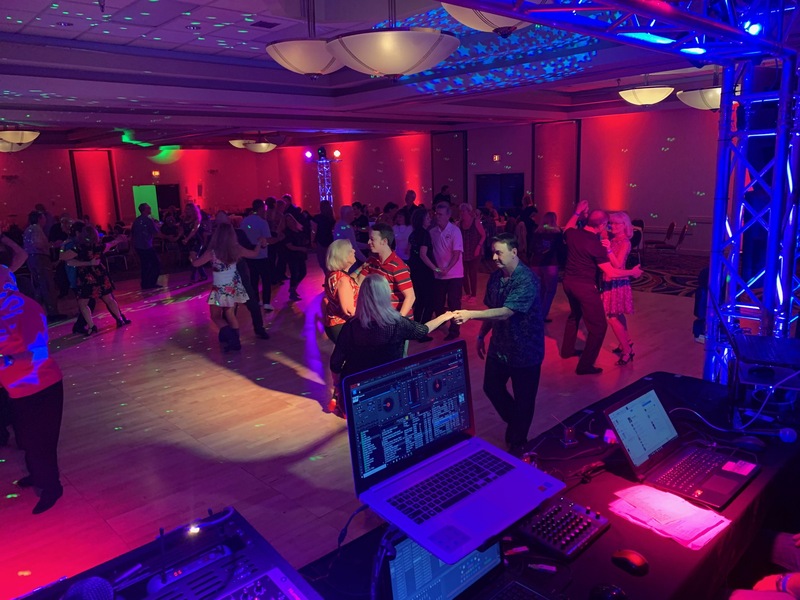 Featuring Team DJ each night for the best in music variety. New! 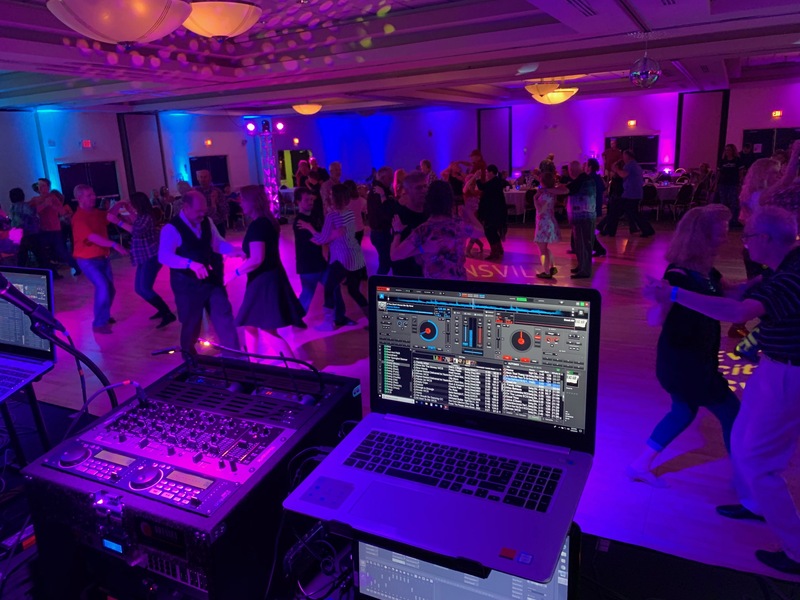 We added the Weekend Event Schedule for Swing Fling 2019. We are starting a waiting list in case of any last minute cancellations. Email president@ercbopclub.com or call Kathy @ 812-459-9073 if you are still interested. Get your tickets for Swing Evansville 2020 March 26, 27 & 28 using the ticket button below. 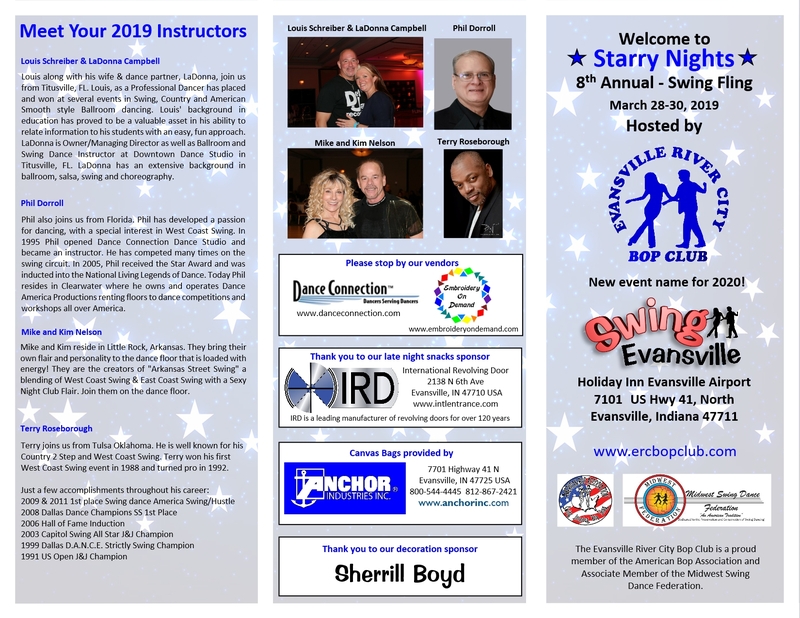 Swing Evansville 2020 Tickets on Sale. It was an absolute amazing weekend. Great Pro Staff. ( Which are all coming back next year! ) Lots of group lessons given by our pros. An amazing group of dancers attended from 14 different states. 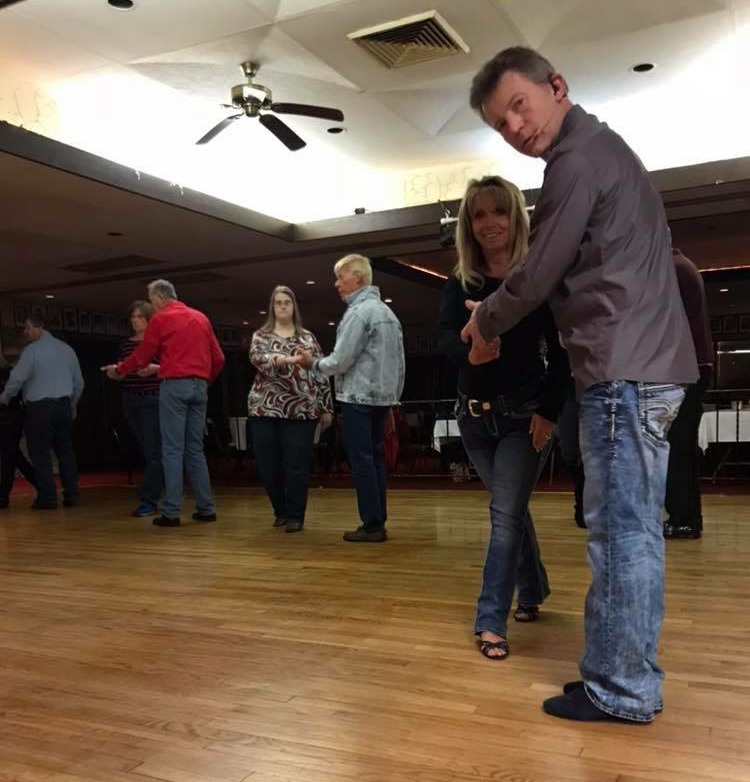 Hours of social dancing and some amazing pro demo's. 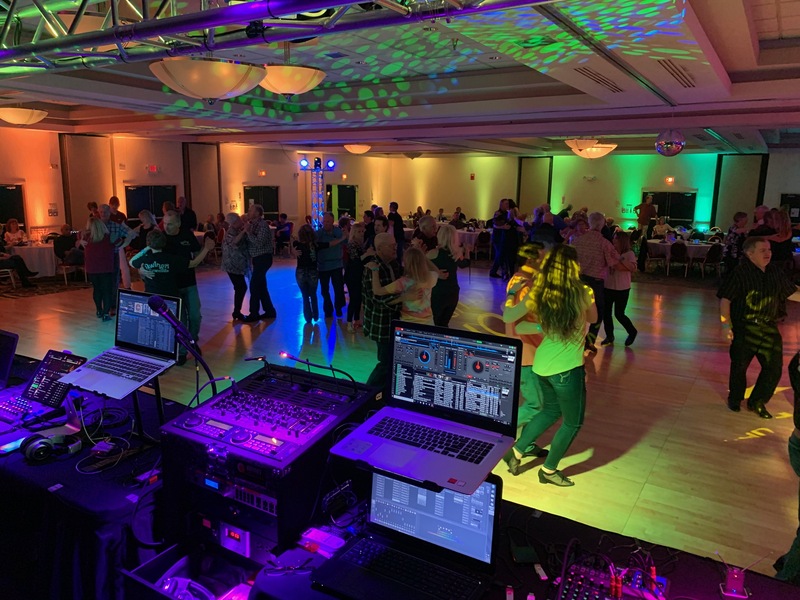 We've received tons of complements on the Music, Decorations, Sound & Lighting, Fun afternoon dance games and list goes on. Tickets are now on sell both on PayPal and by Mail-In registration form. 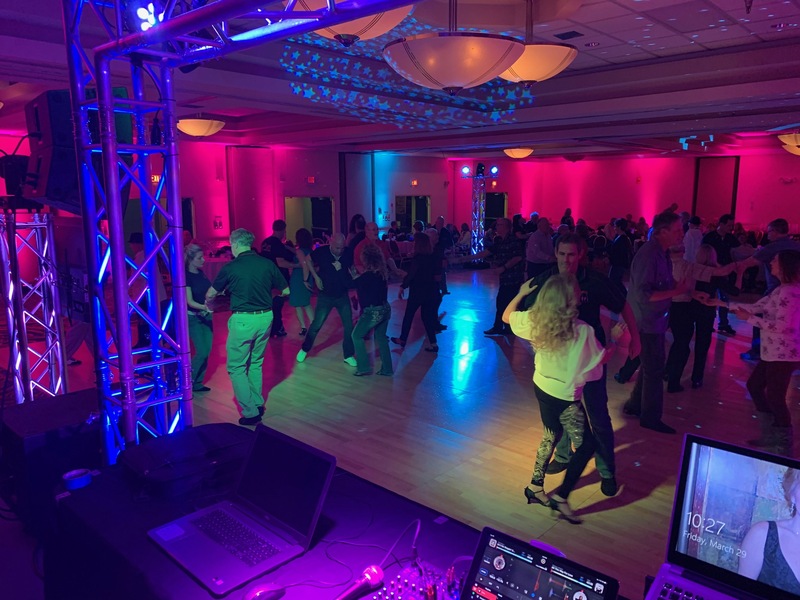 We have a new name "Swing Evansville"
Keep in mind this year was a sell out and many of those that attended this years dance have already purchased their tables for next year and we're already 1/3 of the way of being sold out for 2020. So get them early. 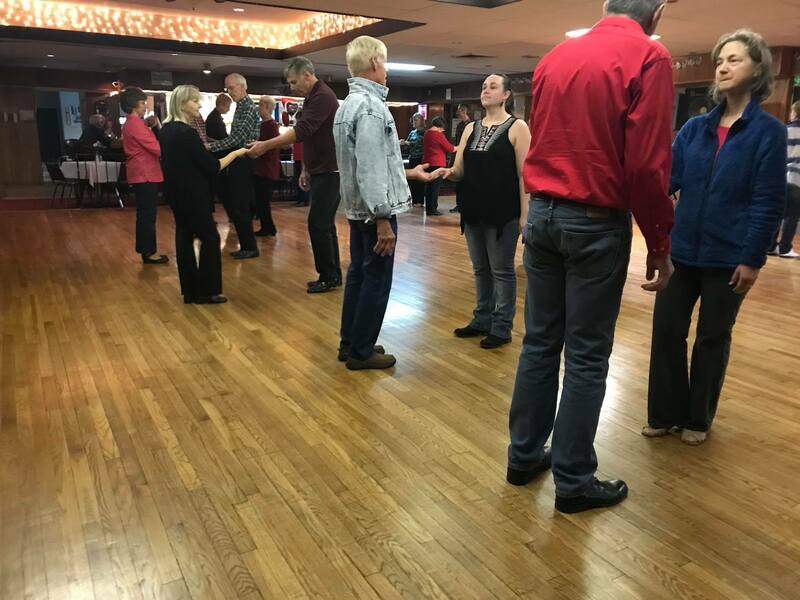 Weekly Wednesday Night Dancing and Lesson At The Eagles. 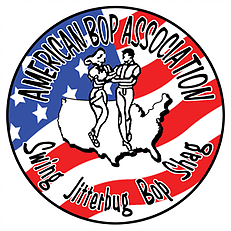 The ERC Bop Club is Proud to be a member of the ABA and associate member of the Midwest Swing Dance Federation. 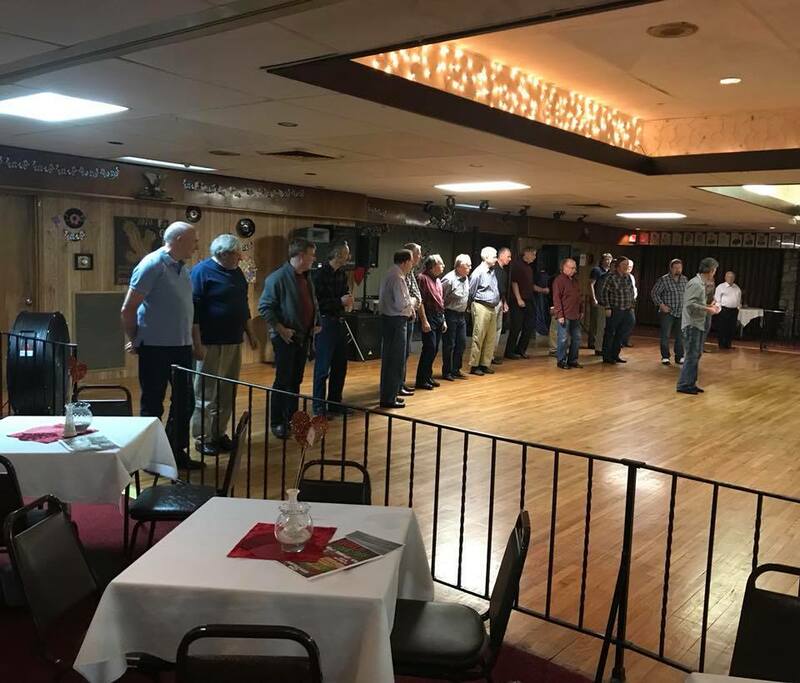 Weekly Wednesday Night Dancing At The Eagles. 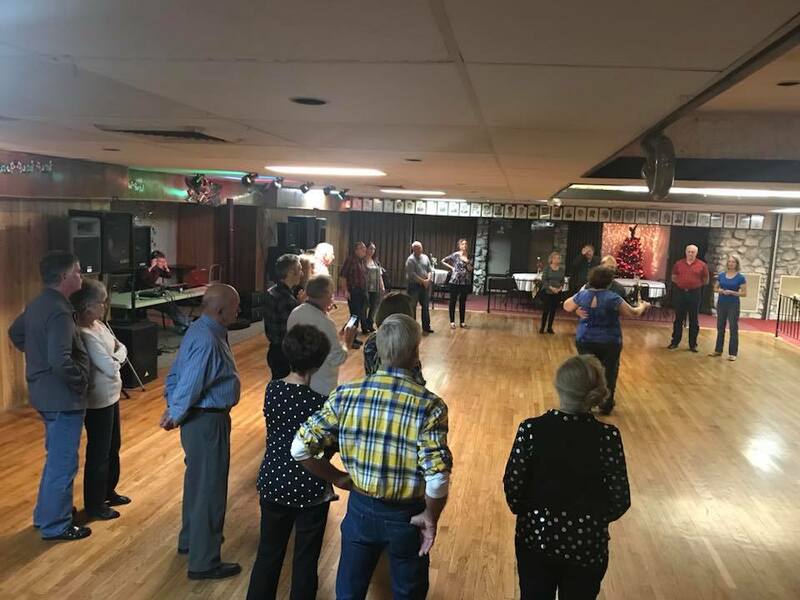 We have a dance & dance lesson every Wednesday night @ 6:55pm at the Eagles 6000 Old Booneville Hwy Evansville, Indiana. It was an absolute amazing weekend. Great Pro Staff (which we're booking again for next year) with amazing group lessons. An amazing group of dancers from 14 different states came to be with us. 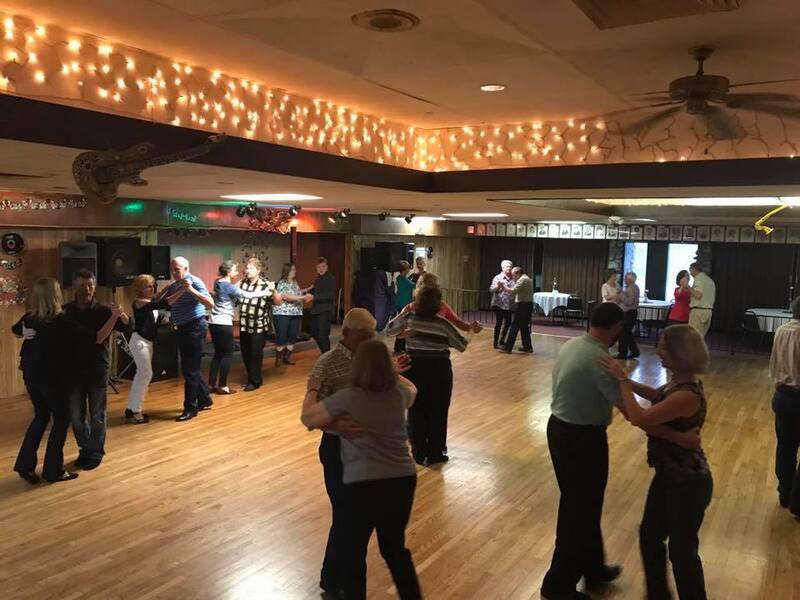 Hours of social dancing and some amazing pro demo's. 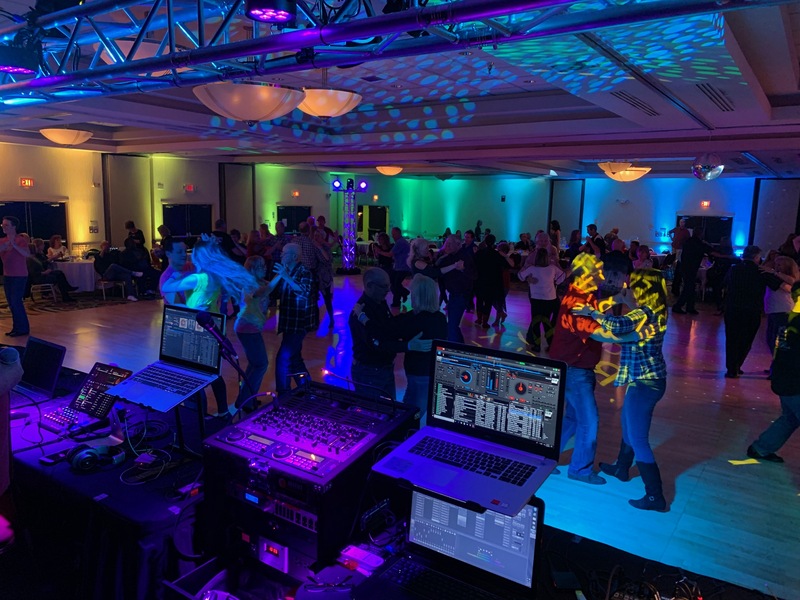 We've received tons of complements on the Music, Decorations, Sound & Lighting, Fun afternoon dance games, Food, and list goes on. Tickets are now on sale both on PayPal and by Mail-In registration form. Coming up quick, Christmas Dinner & Dance! Our Christmas Dinner & Dance will be Friday, December 7th. You Must Pre-Register for the dinner by December 1st, so we can let the caterer know how much food to prepare. This dinner and dance is once again Free for all Bop Club Members. Guests who preregister and pre-pay, may attend at a cost of $25 per person. 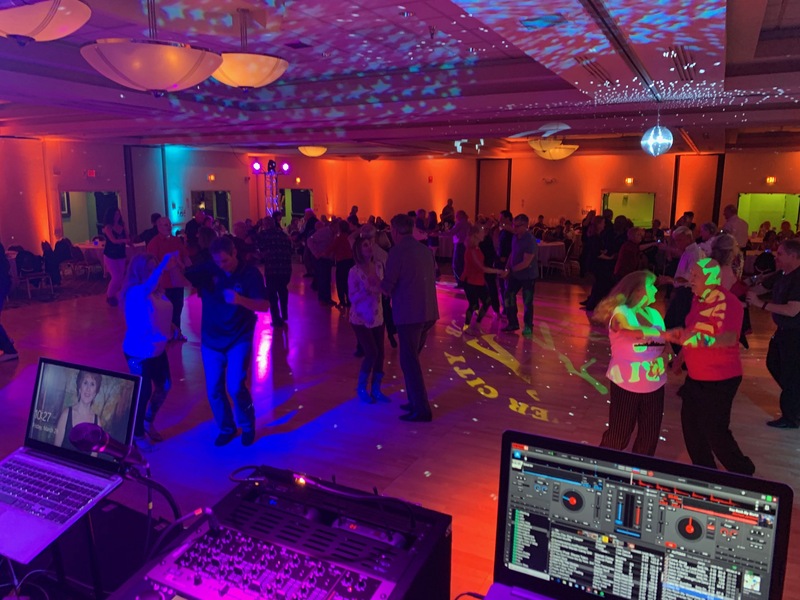 If a guest wishes to join us for the dance only, it is $6.00. 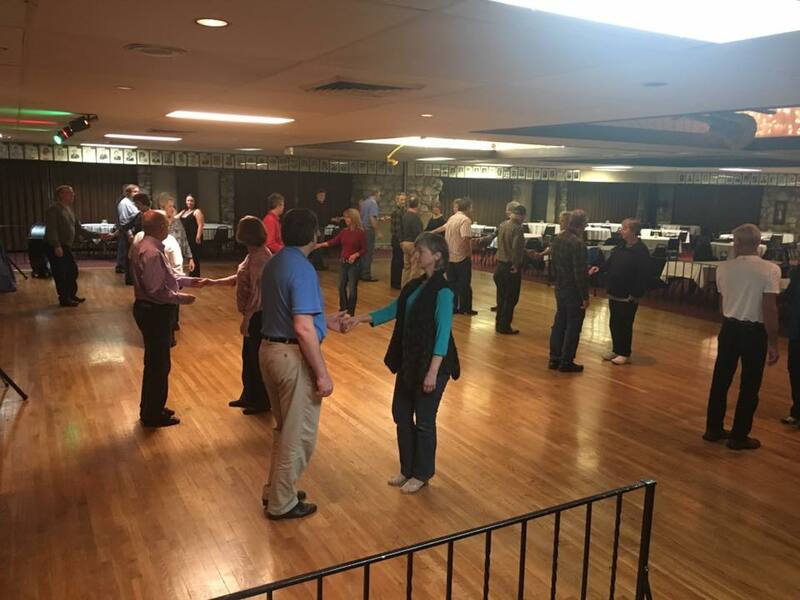 This is usually one of our largest dances of the year, with around 90-100 attending our festive,fun evening. You can sign-up for the Christmas Dinner/Dance at any dance, or reply via email or text me (812-459-9073) and I'll add you to the list.